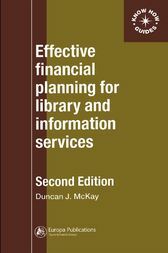 This title is a concise guide to financial planning, with definitions of financial terms and the key processes involved, which also provides tips on how to present your budget most effectively to secure funding. As pressures of business increasingly affect all information functions, it has become ever more important to be able to justify the costs involved in running any form of information function. This second edition covers budgetary implications related to developments in information source provision.